Sunday 12th June 2016 marked a very significant day for the Australian Protectionist Party in Western Australia, as elder statesman Graeme Campbell, the father of modern Australian nationalism, addressed an eager crowd of patriots. The event was open to members from a number of different patriotic organisations, and it was great to have all the different people and groups present. Master of Ceremonies Troy Ellis introduced Mr. Campbell, who, speaking at his first public event in years, was in fine form. There were a few moments of unintentional hilarity, as Mr. Campbell’s dog, that was supposed to have been shut out of the building, managed to find a way in, and attracted by its owner’s voice, wandered onto the stage. Mr. Campbell’s speech included considerable rapport with the audience, and he answered a number of audience questions. The second speaker was Mr. Lyn Vickery, lead Senate candidate for the Australia First Party in WA, formerly of One Nation WA. He was followed by Mr. Brian McRea, also of Australia First WA, who stressed the need for nationalist micro-parties to cooperate — a sentiment shared by the Australian Protectionist Party. All in all, it was a great event, where new connections and associations were made, and old ones rekindled. 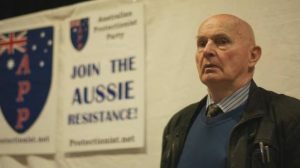 The event will be available in some form for public viewing on the Australian Protectionist Party’s YouTube channel at some point in the future. We would like to thank Mr. Campbell, and all the attendees, and send a warm thank you to the videographer for having donated their time and effort toward the event.